Happy Friday every one! We wanted to share with you this ADORABLE little family as they celebrate another baby coming into the world with an Alexandria maternity session! If she’s going to be anything like her big sister, she’s going to be a little spitfire! But seriously, how absolutely beautiful is this family?! Toney and her family were scheduled yesterday for their maternity/family session, but we were forecasted to have a heat index of 109 degrees!!! So we put our heads together, got back to the drawing board, and realized that our calendars lined up for this morning. We’re so happy we decided on a morning session instead of an evening one because although it was cooler in temperature than yesterday, it was still REALLY hot! This little girl was fighting the heat but she was such a trooper! I mean look at those SMILES! It was so funny because she loved it whenever a puppy would go by. She would just completely stop talking (or crying) and stare! When she didn’t want to do something, she would say “I don’t want it!” Kids crack me up! This family came to us because our dear friend Candace from Candace Nicole Photography had broken her leg while we were in Iceland and she had to reschedule and cancel a ton of her portrait sessions due to doctor’s orders. 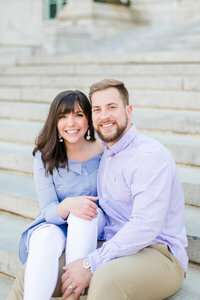 Luckily, we had some availability in our calendar and quickly got their alexandria session on the schedule! We love their sweet family and so Tony and I have been looking forward to our time with them this past week! We just loved getting to know these two and I am so excited for you to see some of my FAVORITES! If you loved this, you will love this family session as well!